The UK Treasury and Bank of England’s £80 billion (or £1,277 for every man, woman and child in the UK) Funding for Lending Scheme continues to hurt savers. The banks currently have no need to borrow money from us savers when they can go directly to the Bank of England for a nice low rate of 0.25% per annum providing they meet a few T&C’s. Money Saving Expert now tells us that if you are in the market for an easy access savings account you can get an interest rate of 2% AER with Derbyshire. Forget to switch after 31 March 2014 to the next bank or building society offering the highest interest rate at that time and that becomes 0.5%. Last month you could get 2.35% on accounts offering a bonus for a fixed period of time and back in June 2012 you could get 3.2% AER variable with Santander reducing to 0.5% after 12 months. So in less than 12 months the best rates being paid have fallen by more than a third. Choose to go for a no nonsense easy access savings account (always my preferred option) that available interest rate is also 2% today from Virgin. Last month the best buy was 2.3% AER with West Bromwich Building Society. Back in June 2012 the best rate was 2.75% AER variable with Aldermore. I must note that I’ve left the Santander 123 current account out of the analysis even though it’s currently paying 3% AER. I have no time for this sort of account. To me it’s made deliberately complicated and I don’t believe the average punter would have a hope of calculating whether this account is the best for them. It pays the 3% only on balances between £3,000 and £20,000, requires a minimum deposit of £500 per month, takes a £2 per month fee (remember you’ll pay tax on the 3% but won’t be able to claim against the £2) plus in the circles I move I hear of the poor customer service that Santander offers. I can’t help but feel somewhere in the small print I’m bound to lose out against a simple no nonsense account. If somebody is having success with this account please do comment below as I’m sure many readers (I know I certainly would) would like to know if you are seeing success. Of course we must also consider that the easy access savings accounts detailed above are the best accounts out there. My chart today shows what is happening to the average account. For those that are interested last month’s analysis is here. 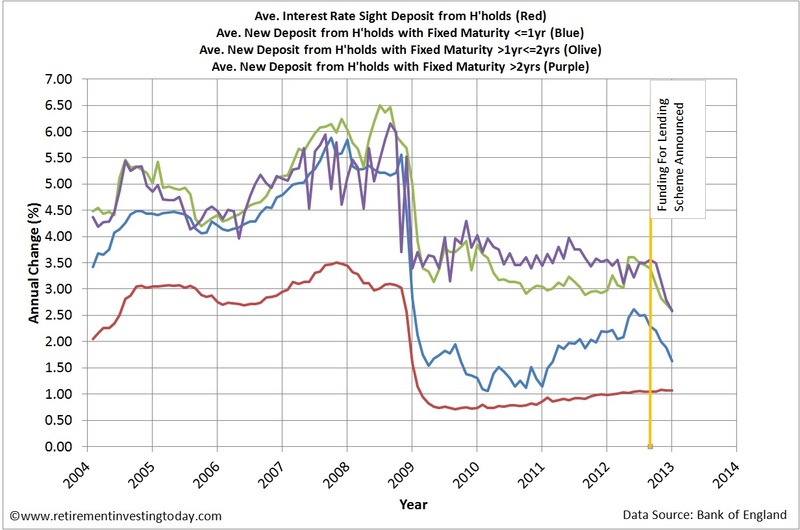 Since the FLS was introduced in August 2012 interest bearing site sight deposits from households (the red line) have risen a small 0.03% to 1.07%. The interest on fixed maturity savings accounts is however a very different story. 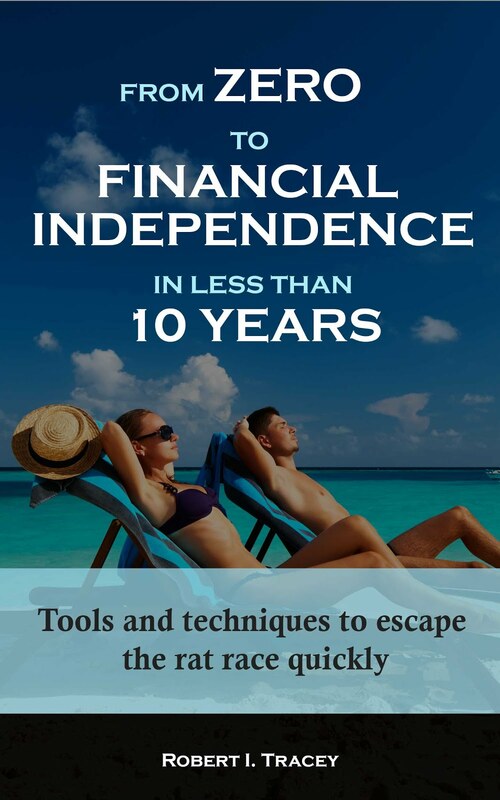 Time deposits with a maturity of less than or equal to 1 year have fallen 0.66% ending up at 1.63%. 1 to 2 year maturities fall 0.78% to 2.61% and greater than 2 year maturities have fallen 0.98% to 2.58%. You'll know that as your building society, we're committed to offering you genuine value across our range of savings accounts. Over the last few months, we've seen unusual conditions in the savings market, with many other banks and building societies reducing their savings rates. On average, Best Buy fixed and variable rate accounts have dropped by 0.80% (based on Moneyfacts Best Buy Tables showing the reduction in the highest rates available between 01/08/12 and 01/01/13). After much thought and careful consideration, we've now made the difficult decision to adjust our own savings rates in line with the rest of the market. I actually found the tone of the letter an insult to my intelligence but I guess the letter wasn’t written for people who read Retirement Investing Today. Words like “committed to offering you genuine value”, “many other banks and building societies reducing their savings rates” and “difficult decision” to me sound like nothing more than blaming somebody else and lies. If only they were transparent and honest with something like - over the past few months the market rate needed to be paid on interest to attract and retain savers has reduced and thus we will also be reducing the interest rate we offer. At the end of the day though none of it matters as my 2.1% AER will now reduce to 1.65% AER. I therefore need to start looking for a new account however I’m going to wait a few weeks to see if these falls stabilise across providers. The last thing I’d want to do is find a new bank, go through the hassle of moving my Emergency Fund only to find it too reduced its rate to 1.65% or worse. - NS&I Index Linked Savings Certificates. I’m a big fan of these however unfortunately they are currently not on sale. While they were on sale I backed the truck up and so now hold about 16.7% of my total portfolio in them. Over the last six months what has been the overall real return in your UK based portfolio? What do you think your overall real return would have been had the Bank of England and the MPC tightened monetary policy and reduced QE or not implemented the FLS? To be honest this is not about my personal return. This is about the economic decisions of those who should know better. - One where Government tells the truth and doesn't continually make promises that it knows it has no hope of keeping. If you treat people like children then they'll act like children. - One where the Bank of England uses sensible valuation metrics to head off bubbles before they occur. For those that don't think that's possible I would steer them to Andrew Smithers excellent book Wall Street Revalued (link provided within the "Books That Helped Me" tab above. - One where the reckless (including the over leveraged and plenty of the banking fraternity) are punished for their mistake. Punish them once and they might not make the same mistake again which might lead to more sustainable behaviour in the future. The current policy has done nothing more than say go for it. When it's rosy you win and when it all falls apart we'll keep you afloat. All that does is encourage yet more recklessness going forwards. - One where the prudent are rewarded rather than see their behaviour punished through derisory interest rates resulting in real terms losses while they watch the reckless getting ahead yet again. The current policy says to them be reckless. A few of these policies and who knows maybe someday we'll see a sustainable economy. That's a place I'd like to be investing. "The last thing I’d want to do is find a new bank, go through the hassle of moving my Emergency Fund only to find it too reduced its rate to 1.65% or worse." I understand your predicament. Do you leave your savings with the bank that's just slashed your return, or move it elsewhere and have them do the same? Having opened an M&S everday savings account at the end of last year, I've been shocked at how quickly the rates have dropped of late. It's bad enough that they were not keeping pace with inflation originally, but within weeks they'd cut the rate for new accounts by 0.35%. Now they've just informed me that the standard rate will drop by ~75%, from 1.35% (+bonus) to 0.35% (+bonus). It looks like I will have to spend even less to make up the difference. Excellent summary of the dire situation facing cash holders at the moment. I currently have a Santander 123 current account for want of something better. It is worth it because of the 3% interest rate, so I use the account to hold cash for the year until I have a specific purchase to make in my ISA (cash in the ISA would otherwise earn 0%). If you can keep a significant sum in the account it is a much better deal than the alternatives, such as the much promoted First Direct current account (which also slaps a £10 monthly charge on you if you don't pay in £1500 p/m). By paying household bills through the Santander account it doesn't take much for the cashback to more than cancel out the fee, but the surplus for prudent households is unlikely to be huge. If they withdrew the 3% rate I would probably move elsewhere, but for the time being it provides an extra two or three hundred pounds a year above any of the alternatives I've seen. I also have some NS&I Index Linked Certs, but was disappointed to see the recent changes to the terms and conditions, which have made these less attractive (forcing you to lose a substantial portion of the index linking if withdrawn early). On the other hand they are the only cash investment for taxpayers at the moment that promises to keep pace with inflation, so a no-brainer if on offer. I find this Funding for Lending Scheme totally unfair to savers. 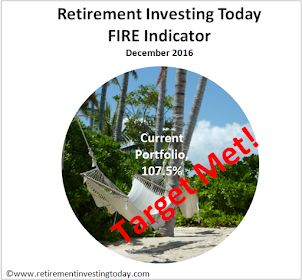 What is essentially tax payers money, is being used to reduce the value of income that many savers rely upon. Surely this government scheme is no more than theft and should be prosecuted as such.